Test run of a 140 Amp DC arc for making Calcium carbide CaC2 by charcoal and CaO. In 2015 I purchased a 200 A DC welder for the purpose it is designed for: better welding results. Stick welding goes much better and smoother. But I could not resist the temptation to (ab)use the device for electric arc experiments, as not only for welding, but also for arc melting a DC arc has better results. I did a few tests in the end of October 2015 with (again) making CaC2 with CaO and crushed charcoal. It turned out that electrode wear was less, when the furnace is hot, the rods can be taken further apart (up till 5cm at 90 A) which makes a larger zone hot enough to synthesize CaC2 which requires over 2000°C. Heating up aluminum to its boiling point (2500°C) was another challenge: I got this done for a few grams of aluminum in less than a minute. 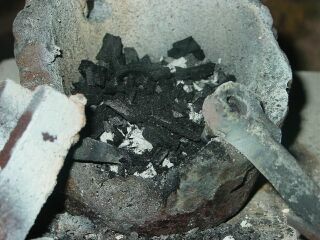 CaO powder mixed with crushed charcoal in a DC electric arc furnace. Melting a few grams of aluminum and bring to its boiling point with a DC welder as an electric arc furnace. 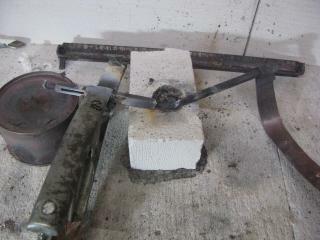 Melting 20 grams of steel from a rebar in less than a minute. 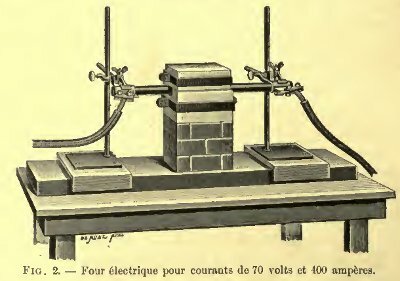 Making CaC2 using the electric arc and letting it react with water. Another CaC2 making using the electric arc and letting it react with water. the CaC2 is formed in its liquid state as the melting point is 2300°C and the arc temperature is higher. Such extreme temperatures (2000-2500°C) are required to favor the reaction to the right. The molten carbide mixes with crumbled charcoal and ash. After cooling, black chunks which feel like cookies can be got from the remains. Throwing them into water releases lots of acetylene gas (C2H2) which catches fire with a bright sooting flame when ignited. Units are expressed in metric and prices in US dollars, unless otherwise stated. (+) Very high temperature can be reached quickly. However, the amounts to be melted are tiny (about 20 grams of iron at 150 A), but, compared to even an oxyfuel torch, the energy efficiency is tremendous. A torch takes a lot of longer time to melt 20 grams of iron which is melted by the arc within one minute. (-) Temperature is hard to control. Much losses due to vaporizing may occur. 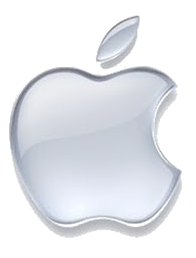 Arc is disrupted easily. There should be enough vapor (from metal or refractory) to sustain the arc. A DC welder may do better as there is no cycling of 100 or 120 times per second. Platinum class metals (including iron and nickel) easily dissolve some carbon from the arcs which makes it brittle. Electrode setup for these experiments. 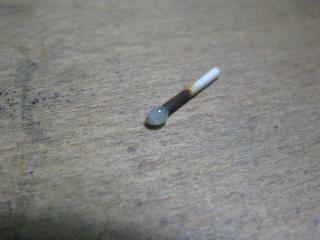 3mm diameter magnesia rod melted with the arc. 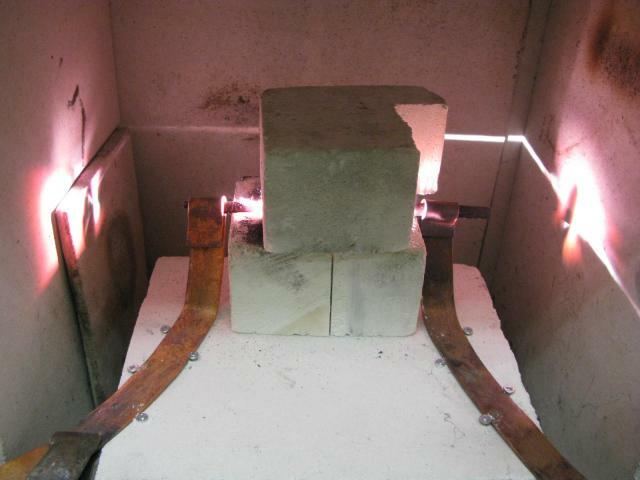 Tested arc melting steel in a cavity in cell concrete (YTONG) which did work within one minute for 10g of steel. Pouring out the steel on the same material did leave melt spots on the cell concrete lined fumehood floor (probably the steel was far over 1500°C as it looked very bright yellow). Pieces of copper boiled within a minute (2500°C) and magnesia rods (for a flame test) of 3mm diameter melted like as if it were plastic (2800°C). Test run of newly made test furnace after the design of Henri Moissan's furnace. Images in Moissan's book of his setup. 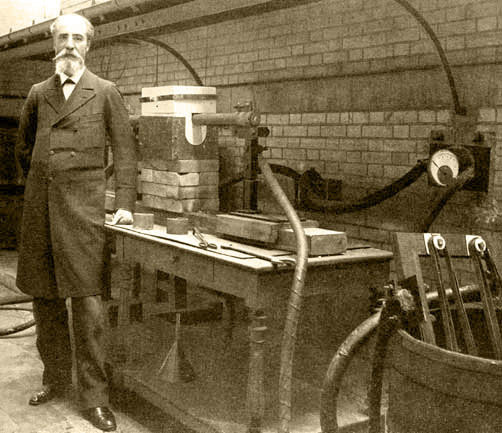 In 1897 Henri Moissan performed extensive experiments with the electric arc furnace and he publihed this in his book. This had a great impact on the metallurgical (particular steel) industry as electric arc furnaces are used more and more in recent years. The picture above is from his book. So this inspired me to perform some of it with as an electric welder connected to the mains as a power source. I used two firebricks (alumina based, rated 1450°C) which are very lightweight and insulating. The size is about 11x11x6.5cm. I carved a cavity of 3cm diameter in the bottom block and two grooves for the 8mm electrodes. In the top block I carved a hemispherical cavity of about 4cm diameter. Then I put a piece of 2 cm3 charcoal in the bottom cavity in which I made a hemispherical cavity by a dome punch. Then I put the electrodes attached via copper strips to a 150A welder and put in in the fume hood. I put a piece of aluminum (20 g) in it to vaporize it. I started the arc with 110 A and this time the arc kept sustained (probably due to the conductivity of the Al vapor) but th arc started blue but turned very pink which meant that the bricks contain calcium. Mg does not color the flame and Al light blue. Maybe the pink is a mixture of the orange red Ca color mixed with blue Al color.White smoke appeared from the furnace, probably condensed Al2O3 vapor. But after a few minutes running I stopped and opened the top brick and I saw a blinding white hot mass of a pudding like substance which was probably 1700°C or more.. It turned about that the 1450°C rated bricks were molten like it were plastic. After cooling a gray glassy substance (frozen liquid brick which was very hard) was on the inside. I saw some small aluminum balls which was all remained from the aluminum strip I added. Later (22 nov) I made the same bricks as described above, but now from cheap YTONG inner wall blocks (which are not designed as refractory). This resulted in melting as well but not as quickly despite these bricks already melt at 1400°C, but these are denser. 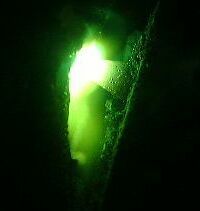 Never look into the arc with(out) anything but a face shield designed for electric arc welding with the dark green glass. Failing to do this results in sitting upright in your bed with painful eyes the night after and, worse, permanent damage to your eyes may result ! Gas-welding goggles or ND4 gray filters are NOT suitable as they don't protect from the strong ultraviolet rays !! When viewing with a spectroscope, do it as short as possible and shield off your other eye and face ! Always wear heat-resistant gloves and shoes easily to kick off. Keep any inflammable stuff away from the arc and beyond reach of any sparks. Particularly melting even only 10 grams of iron or steel may spark as far as 1 m away. For this reason use protective clothing which is hardly inflammable. The power switch (which also switches off the transformer or welder itself, not only the arc circuit) should be within reach in case of emergency. A bucket of cold water or, better a running water tap to immerse burnt body parts in case of. Ventilation hood. Because of the very high temperatures, most substances vaporize and/or decompose and may expel noxious fumes. These may consist of very small particles of silica or CaO which is condensed vapor. Do not inhale any fumes coming from the arc. Perform the experiments outdoors if possible. Virtually any material (even the highest grade refractory, including the "unmeltable" magnesia) melts or even vaporizes in the arc. Take this in account. Do not make arcs directly on the 230 V or 115 V mains as there is a strong and lethal electrical shock hazard. Moreover, the current is so low compared to a welder that only minimal amounts (< 1 g of iron) can be melted. The voltage between the electrodes or one of them and ground should not exceed 42 V for the same reason. Electric welders usually comply with this rule. In most countries (e.g. 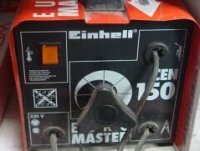 Western Europe) sale of unsafe welders is prohibited. In short, generally safety rules for arc welding apply. A transformer yielding low voltage and high current (at least 100 A), preferably yielding DC does a good job. Electric welders, even the cheap hardware store AC buzzboxes do well. They are usually available for under $100 complete with welding mask, electrode holder (handpiece) and clamp. 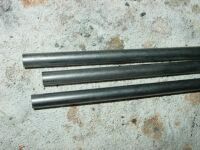 Carbon rods. One option is using flat 4.5 V batteries with each three cells of which each cell has a carbon rod of 6mm (1/4") diameter * 80 mm. These batteries cost about $2-$3 each. But the remaining black slurry should be treated as hazardous waste and can leave unwashable stains as it is manganese dioxide (MnO2). A better option is graphite stirring rods of 6-12 mm diameter (1/4"-1/2") used for foundrywork, available in jewelry casting supply shops. Take enough rods. Rods are consumed too due to combustion and vaporization. One 4.5 battery rod is consumed completely after 15-30 minutes of use, spread over more 'sessions'. Charcoal chips may work as well, but they tend to break very easily. Thick copper wire of at least 3 mm diameter (6 mm2), e.g. 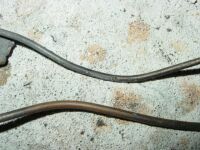 grounding wire. Remove the (usually yellow/green) insulation if present. Anneal before use to enable easy bending. High-grade refractory which insulates well. Magnesia based refractories are best but alumina works well. Chamotte absorbs much heat. 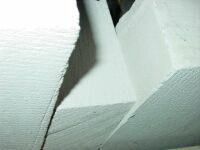 The gypsum based building blocks for inner walls from YTONG designed for insulating inner walls of buildings, do well (see picture left) because of their excellent insulation properties. It will melt at about 1400°C, so some slag will be formed around the arc area. When not available, even ordinary bricks or concrete tiles can be used, as the extreme heat only occurs locally. Sizes of about 5x5x4 cm suffice. Carve a cavity of about 2-3 cm (1") diameter and 1 cm deep in it. This is the "crucible". Extra clamp. 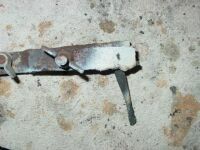 The clamp of the welder might otherwise be damaged (the carbon rod gets so hot that where the carbon is in contact with the iron of the clamp, the iron melts too) so that it cannot be used anymore for welding, where the welder is actually designed for. A hands-free welding helmet is more useful than an ordinary handheld mask. When holding the welder's handpiece with one electrode, the other hand is free to feed the metal into the puddle. The instability of the arc requires hand holding (and moving) of one electrode, so one hand is 'occupied'. Cut about 25 cm from the wire and attach the wire to one carbon rod by e.g. winding it one or two times around the rod. Make a tight connection without any play, otherwise it cannot bear currents of 100 A and more. The other end can just be clamped in the handpiece just like a welding rod. Clamp the other carbon rod in the free extra clamp and clamp that one in the clamp connected to the welder, close to the carbon rod to minimize resistance. Put the end of the latter rod above the center of the crucible. Fix it properly, as the heavy cable to the clamp tends to move the rod away (and fall on inflammable material). Start with a low current (50 A). First test it 'dry' (without metal). Hold the handpiece and let both electrodes touch. You see it sparking and making a sputtering noise. Pull the electrode in the handpiece slowly apart from the other one. The best arc is got when it is long (1 cm), shows a 'flame' and makes a humming sound rather than a loud sputtering sound. When it disrupts, make contact again and pull them apart again. 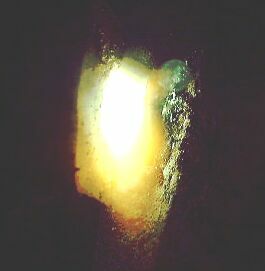 After a few seconds the refractory melts. Even magnesia or pure lime (CaO) show a glossy appearance. You don't see much molten CaO or MgO, not because the temperature is not high enough, but because the boiling point is only 100-200°C above the melting point, so it's rather volatile at the melting point. Now stop the arc and put some nails in the crucible. Start over again. After the arc starts, any iron close to the arc melts. Moving the arc over the nails or pushing the nails to the arc with an old screwdriver may speed up melting. The molten iron tends to contact with the carbon electrode(s), but try to prevent that. Avoid any direct contact of the carbon electrodes with the molten metal if possible. Otherwise the current flows through the iron (and the welder hums loudly, which also happens when an electrode 'sticks' during welding) and the arc is gone. Moreover the iron gets contaminated with the carbon and gets cast iron. After one minute you'll see that everything is molten. When is does not melt all (it freezes further from the arc) increase the current on the welder. An excellent application is steel casting. As pispot steel (ordinary iron with less than 0.3 % carbon) always takes a little carbon from the rods, it is converted into steel after one melt. This is simple to check. When sawing it with a hacksaw and the saw gets blunt, it's clear it's steel. Here is a table which tells the behavior of different substances. Iron or steel Blue - - Iron melts and tends to stick to electrodes when no slag added. Sparks well on the air. Leaves brownish residue of Fe2O3. Marble CaCO3 Pink + CaCO3 decomposes and marble crumbles, later the CaO melts (at 2600°C) and vaporizes @ 2800°C to a white smoke. Marble CaCO3 chips + charcoal Pink + CaCO3 decomposes and marble crumbles, later the CaO reacts with the carbon which results in CaC2 (liquid: freezes at 2300°C). After cooling, this carbide reacts with water,releasing C2H2 acetylene gas. Impure silica stones White o SiO2 melts to a syrupy and sticky substance and issues white smoke. Glass Pinkish orange 1 - Breaks apart. Do not try without proper protection, as the glass breaks violently due to very poor heat conductivity ! 1 Depends on composition. 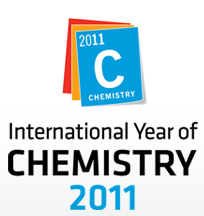 Here, Na2O and CaO containing glasses are considered. For more info you can mail me. See on Google Books for the extensive reports of Henri Moissan with his arc furnaces around 1900.